You are eternal, yet you are my friend. You are king of kings, yet you know me better than I know myself. You have a plan made, you have written all my days in your book. You are pure love. You want us to know you, you want us to walk close to you. Jesus sorry that I argued with my family on Thursday and Friday. Sorry for talking about the people I love behind their backs. Sorry Lord that I didn’t take time to read your word on Friday. Sorry Lord that I haven’t been talking to you a lot lately. Thank you Lord for gran n asking about how to be saved, thank you for C reading your word. Thank you for keeping us safe last night and helping me get up in time yesterday. Thank you for the good weather at the two family weddings this month. Thank you Lord for helping me get my coursework all over. Thank you for car letting me sleep over. Thank you for CT’s new job in B. Thank you for T getting safely back to S. Thank you for my family offering to meet me for lunch on tues. Thank you for my bf’s kindness last night. Please Lord help gran n to make that final definite decision to give the rest of her life to you. Help me to do what it takes for my family to know that I love and respect them, albeit imperfectly. Please Lord give me wisdom and sensitivity and compassion to know how to encourage C. Lord please help me in my work, to do my best and work hard. Bless jb and strengthen her as she has shown me great hospitality. Lord please fill me and Bf up with your Holy Spirit, help us to keep our focus on you alone. Lord I do desire and long to be married and have children. Lord you know that, yet I am not keen to have a lavish wedding day. Lord direct us, show us your will. Please help L&j find a good house, exactly where you want them. Please help Bf and I to grow in closeness to you most importantly, but also to grow in openness and faithfulness to each other, you know I have a long way to go. Help me, I need you God. In Jesus mighty name I ask. Amen. 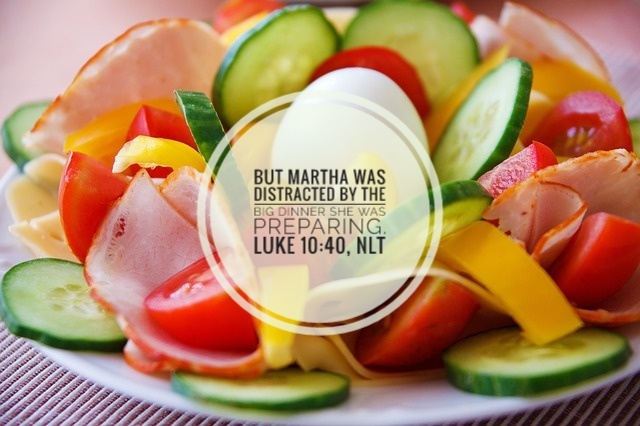 Are you distracted, worried, and upset by your circumstances? More importantly, is that keeping you from listening,really listeningto what Jesus is saying? God you are great! You are adorable! You are beautiful in all ways. You are correct all the time. You are eternal and ageless. You are faithful and forgiving. You are good to me. You are good to us. You are honestly the only person I can trust, I don’t even trust myself, only you. You are inviting us to come close to you, to call out to you, to tell you we need you! You are jealous for our attention and allegiance and our loyalty. You are looking for me to recognise your power and influence on the issues going on around me. You are gently using my current situation to improve my character and somehow are working out your plan and protecting me, despite my poor choices. You are majestic, you are marvellous, you are magnificently holy, true and too big for me to comprehend. Jesus you are near. You are right beside us, waiting for us to turn to you, to stop ignoring you. Jesus Christ you are the one way to God. You made the way open to us. I have messed up and missed out. I need your help. You saved me and took all my shame away, all I need is childlike faith and trust in you and you do the rest! Lord Jesus you are perfect. Faultless. In the quietness You speak life to me when I am still. Lord Jesus you are my rescuer, you are real. You are ready for us to be ourselves with you. Lord Jesus you are satisfying in a world where everything else fails to satisfy. Lord Jesus you are true, trustworthy and tougher than we think! Lord Jesus you are unstoppable. You are wonderful in every way. You are worthy of all praise! You are! It is exciting knowing you. You are totally loving and know what’s best. You know each one of us and felt each one of us was worth dying for. Jesus you died for me. What a friend you are! You zealously care for me and I love you because you first loved me. Lord please help me to move forward now. My mind keeps replaying snippets of what was said. Please help me to forgive and see things how you see them. Lord please may this not be a damper on my whole weekend or week. Lord help me be slow to anger. God take away my arrogance and envy. Lord thank you for helping me to stop procrastinating yesterday. Thank you for the perfect weather we’ve had this week. Lord I think I need someone to pray with me. Should I ask the person I argued with, or my bf, or the prayer ministry team? Please Lord fill me up with your Holy Spirit, with godly wisdom and spiritual wisdom. Lord help me to remember you love me, you made me, I am your child, You are King of Kings, you are my Rock, you are my comforter. I love you and you never leave me, you love me faithfully and unconditionally. Thank you Jesus! You are awesome, beyond comparison, you do wondrous, mighty things every day. You do things greater than I can dream or imagine! What a turn around! What a change can come in a week! My bf met me for dinner after work one week night. I was buzzing all day looking forward to seeing him and at the same time, stopping myself from talking about it incase there was a change of plan last minute! My bf is thinking about buying a house in his hometown! Lord how exciting is that!?! God I don’t know what to say! But I am delighted – thrilled even! I think it’s great to try to get on the property ladder, and even better if it’s without needing a mortgage as it’s an old, tiny house, no central heating insitu! Am I crazy?? It’s awfully close to his work and church – maybe too close for comfort!! 😉 it’s going to take a lot of money to modernize it. It’s so small – but that could be a major positive as it means less cleaning and less space for clutter! Lord should we both contribute to the cost? We aren’t even engaged yet. Lord give us both wisdom. A old friend of mine once told me her biggest regret was getting a mortgage so young. She felt tied when she decided to go to missionary work in South America. The beauty of this is we could manage to pay without a mortgage!! Lord I feel scared and excited at the same time! I’m mega pleased that he is thinking of a future with me, and we are sure we want to wait till marriage before living together. It just sort of seems like such a sudden, major step forwards!! Lord open the door that you want open and close the doors that you see fit to close. I trust you and want to be led by you, even taking risks if it seems clear to be your prompting. Lord fill us up with your Holy Spirit, for your glory, for your name to be honoured, for your power to be seen and for us to see others the way you see them. It doesn’t really matter about a house or a place to live. The most important thing is people, relationships, friendships and families — all people need you Jesus, even if we haven’t grasped it yet! You give meaning, purpose, fulfilment, hope, joy, life to the full, peace, security, comfort, real and lasting love. You don’t make life easy by any stretch of the imagination, but you make it worth living and help us through and promise to never ever leave us. Dear God – there must be more than this!? I know you are great! You know best! You are the only truly Faithful one. Nothing compares to you, even Bf doesn’t come close. I’m sorry for putting him on a pedestal, for having such high expectations of him and holding him in your place. I’m sorry for not putting you first and for not encouraging him enough to put you first!! Help us Lord. I’m sorry for feeling resentful towards wise, elderly J as she suggests that he should be making more effort to come and see me on week nights. God I found and still find that extremely difficult. I tell myself he maybe doesn’t want to interrupt my plans, he maybe is busy, doesn’t have time after work or that I should be driving down to see him as I finish work 90mins before he does! Lord what do you think I should do? J thinks I should end it. I think I should try driving down mid week to see him once a week or fortnightly. Thank you Lord for giving me a job closer to home and closer to him. Thank you that now we are only 45 miles apart, compared to 90-100! Lord it is interesting that we haven’t once met up mid-week since I’ve moved, despite it being 5months ago! Is that significant? Lord I feel like I am struggling with lust! Every time I’m with bf I feel turned on. Every night (almost) I feel a longing to be next to him, I feel envy towards engaged and married couples and I long to be settled and have security and intimacy. I don’t want to put pressure on bf, I wonder if it’s wise to tell him how strongly I feel and I wonder if J is right and sincerely hope she’s not!!! Lord help me know what to do. I need Godly wisdom and spiritual understanding. Is it right to expect him to meet me midweek? Am I asking too much? I’ve been through all this before already — I wept when I asked him once if maybe weekends were all he wanted, maybe it was enough for him. Maybe it’s best to leave things the way they are. Maybe I am being impatient. Maybe I am obsessing over it? I don’t honestly know. How did Esau work 14 years (7×2) to win Rebecca’s dad’s approval to marry her?!? Anyway now it’s time for me to get up and on with my work. Lord thank you for free will, and the freedom of being single. Thank you for bf and J and how precious both of them are to me. Guide me Lord. Thank you that you love me even more than I can appreciate or understand, far more that I can reciprocate. Please help me to be motivated by love in my relationship, attitude and actions towards bf and others. Thank you for always being with me and continually helping me! Lord you are so good to me. You are mighty. You are eternal. You are creative. You are in charge of everything Jesus. Sorry God that I argued with my brother T yesterday. Sorry that I was short with bf. Sorry Lord that I am selfish. Thank you for my gorgeous nephew! Thank you for the good price that m fixed my car for me! Thank you for my friends and my dad and for Bf and his family. Thank you for my brothers. Please God heal g soon! Please lord she needs your help. God restore her health, spirit and mind. Help her. Bless her. Lord I pray for J – bless him as he grows into a young man to closely follow you Jesus. Help S and J to love eachother, j and most of all You! May they be a good example to him and seek your will for their lives. Bring dad, js, and bf’s grandparents into a close, personal relationship with you. Give them godly wisdom, fill them with your Holy Spirit, bring spiritual revival here!